I feel lucky to get to "hang out" with all my Mom's cool friends! I have new Bug &Roo images? Your next stop is to the amazing Simonne Clay. She colors so so nicely! Be sure to stop and comment on each blog post in the hop as there is a chance to win a $20 Shop Credit on one of the blogs!! The hop closes on Friday Morning at 10 AM est. A winner will be announced at 12 Noon est on Friday!! Beautiful, Hannah! 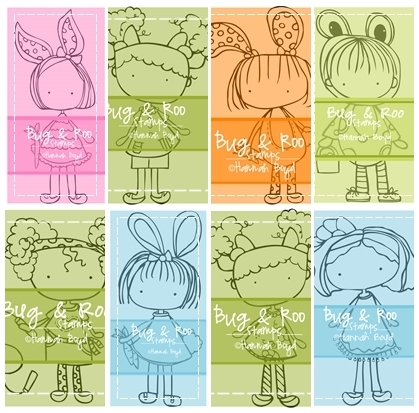 I love the new Bug & Roo images - they are SO AWESOME!!! it is so so adorable.. your new images are so cute Hannah!! Congrats Girl!!!!! love your card!!! What a talented girl you are! Such a sweet card, Hannah! Hannah I am so lucky to get to work with your super cute images. You are one talented chickie! I love your card too. The color combo is just brilliant. 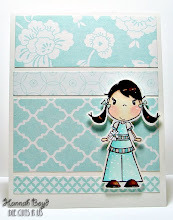 Your card is so pretty and I love that cute image. love it!! 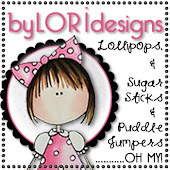 and love the new images..
Oooooh Super cute! I'm lovin her hair! Love the whole package, the colors you used, and the most FUN the image, love how you put the different color flowers or dots around her feet and body!! Wow she is adorable...love the use of black esp. the polka dots! Cute image! I want to squeeze her tummy!! Great work! 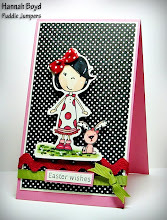 Wow, gorgeous card, love the colors and the bunny girl is adorable! This is just darling, Hannah! I love your coloring and the little pops of color around her. So cute! 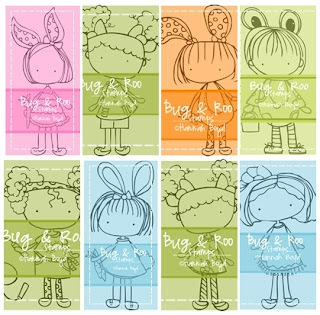 These new Bug & Roo images are absolutely too cute!! Love this image and its beautifully coloured.